Growing up in the 50s unless you heard classical music stations on the radio (not too many in the cities of my youth, Buenos Aires, Mexico City and Austin) this sort of music was something that almost did not exist. It did for me because my mother played Chopin, Bach and Beethoven on the piano. To me it seems that this divergence between popular music and classical music changed with Miles Davis and his 1960 album Sketches of Spain and The Swingle Singers in their 1962 Jazz Sebastian Bach. It seems that Bach lovers were able to tolerate Bach scatted, but personally I was never able to stomach Joaquín Rodrigo’s Concierto the Aranjuez again. Versions appeared in just about every instrument combination possible and thankfully Ladysmith Black Mambazo had enough acumen to avoid their interpretation of the Spanish classic. It was in those years of the 60s until even now when you might hear someone say, “If Bach were here he would have approved of that.” I think that most overstimate that dour Lutheran. I have jazz trumpet man Dizzy Gillespie playing the mouth-harp but I am happy to state here that Bach would not have to approve any of his compositions interpreted on the mouth harp. I have not found any. All the above is simply an overture to point out that Early Music Vancouver’s production of Joseph Haydn’s Seven Last Words, Op. 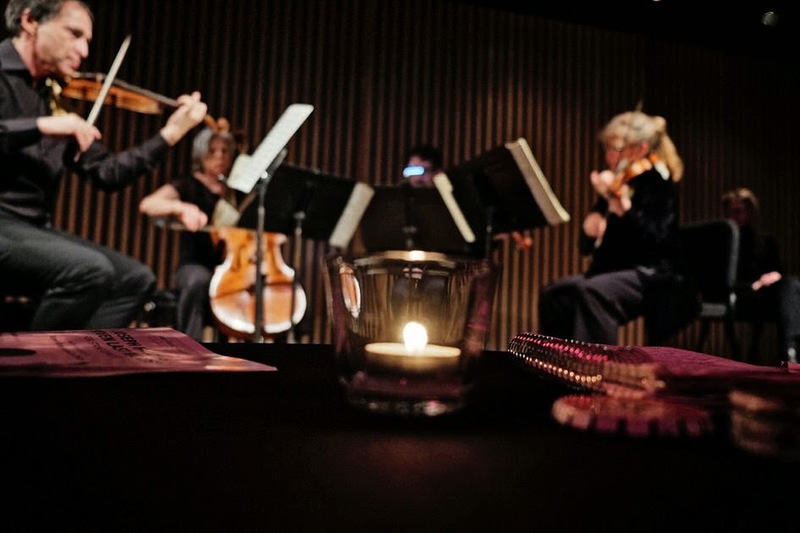 51 for string quartet (1787) held at the intimate Orpheum Annex last night was most contemporary and yet not a note was changed and no strange instruments were to be seen anywhere. 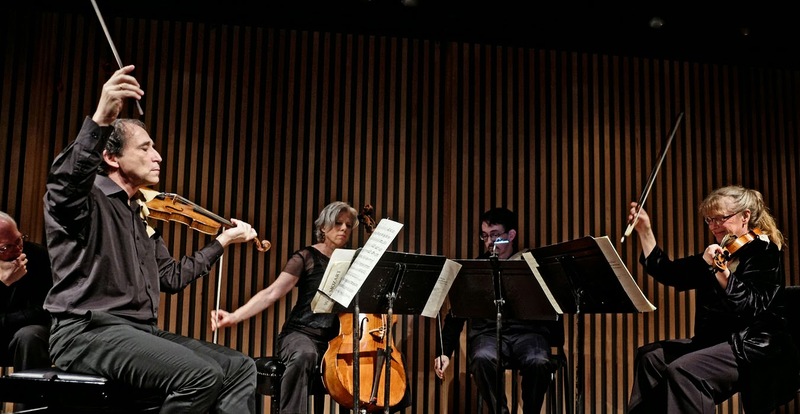 What made the work viscerally immediate was the collaboration between the musicians, Marc Destrubé, violin, Linda Melsted, violin, Stephen Creswell, viola and Tanya Tomkins, cello with the poet duo (husband and wife) Robert Bringhurst and Jan Zwicky. 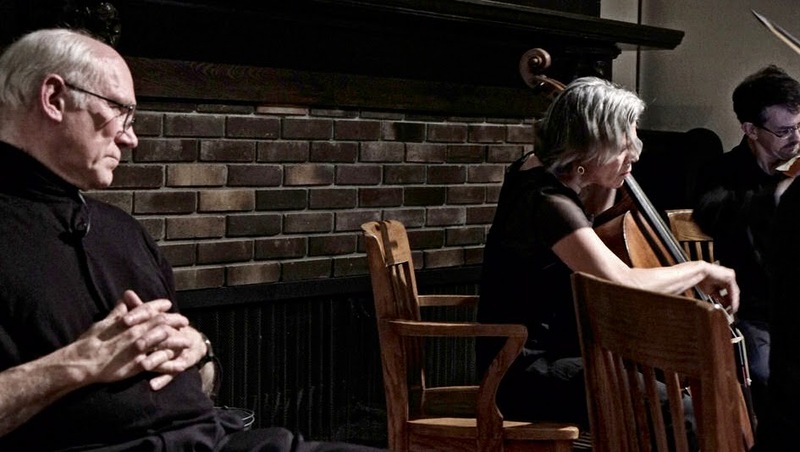 There were intense days of planning between the quartet and the duo at the duo’s home on Quadra Island. The result was an exquisite evening of very intimate music with poems written just for the occasion that were based in spirit to Christ’s last words on the cross. Bringhurst and Zwicky shifted the focus from the crucifixion of one man to the current, (in their words) crucifixion of the earth. The quartet played quietly and only the ninth and last movement Conclusion (Presto e con tutta la forza) – in E-flat major, pulled the stops. Before that movement, from our table (night club type of seating, dead centre, front row), I could distinctly hear Destrubé play magnificent harmonics on his 1685 anonymous Brescia Rogieri school instrument. Violist Genevieve MacKay, who sat in the back of the room insisted she heard them, too. Bringhurst has an odd but most attractive reading voice and cadence. His Ss are long and his baritone voice crystal clear. Philosopher/poet/ violinist Zwicky has a no nonsense delivery and equally good diction. That she seemed to look just to me (probably felt by all others in the room) made her reading that much more daunting. The concert, a Haydn concert changed my silly and most personal opinions on the composer. I may have shared them with a strong donor to the early music movement in Vancouver how cuts off all music after the death of Bach. I was most surprised to see this donor at a November concert of the Pacific Baroque Orchestra smile and sway to the music of a String Quartet in F major by Roman Hofstetter (1742-1815). It seems that this lovely quartet with an immensely popular second movement (of four) Serenata (andante cantabile) was all until recently attributed to Joseph Haydn and known as his Op3. no 5. My conversion to Haydn came about by two CDs that I treasure. Until I heard these two, the Zukerman on CBC Radio, for me (how wrong I was!) Haydn was the bombastic and loud composer of symphonies that seemed to overuse (to this idiot) the tympani. It was the third movement, very quiet it is, Menuetto of the 22nd Symphony that transported me (paradoxically, but I am not sure now) to the repetitive (but appealing to me) music of Steve Reich. The Menuetto seems to end here to begin there all over again, and it goes, on and on and is most lovely. The 7 movements (not the Introduzione or Conclusion) of Haydn’s Seven Last Words had lots of these almost endings and soft beginnings in a row. The Destrubé/Pacific Baroque Orchestra (a smaller orchestra not a big symphonic one) CD introduced me to the quiet and more intimate Haydn. I am now a fan. If I had the money to donate to Early Music Vancouver I would with the stipulation of perhaps presenting the Missa in Angustiis ("Mass for troubled times") or "Nelson Mass" (Hob. XXII:11). 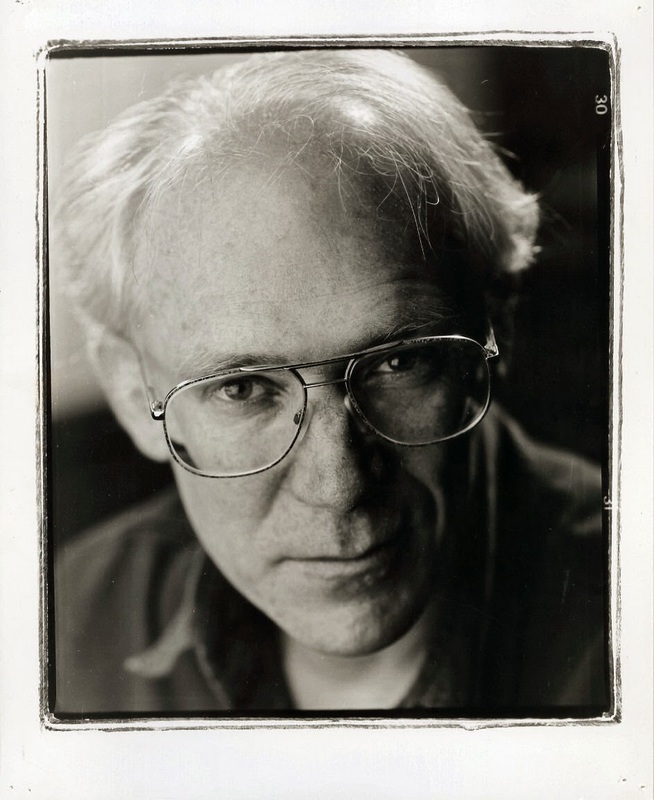 That there is no written record of the Bringhurst/Zwicky poems is a shame. My chances of ever hearing this work live again (but then I did hear it on Thursday at Green College!) are next to none. 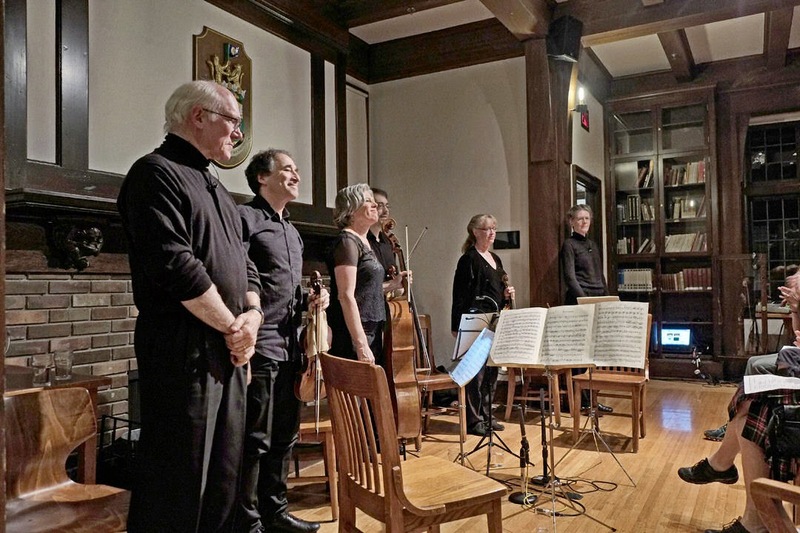 The same applies to all the baroque classics that Early Music Vancouver has brought to our Vancouver. Like Vancouver modern dance and the music of local new music composers it is stuff that will remain in my memory for a long time (in what remains in my 72 years of existence). The concert was special for another reason. The instruments used were used in the manner of the 18th century. They had gut strings (sheathed more modernly in metal). You might have noticed that the violinists and the violist had no chin rests. These instruments, usually played in the smaller venues of the 18th century (the private chambers of kings and princes) were less loud than the beefed up instruments that followed in the 19th century and into our times. Many would say that the sound of baroque string instruments is warmer and more subtle. 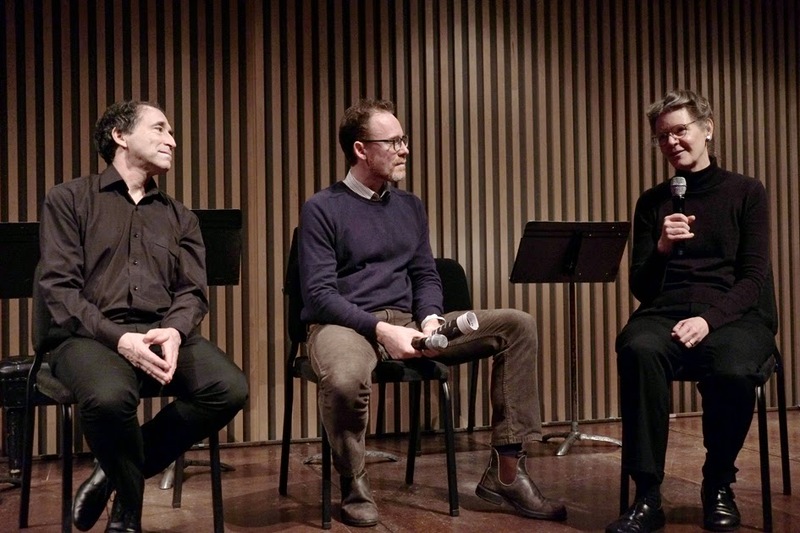 The difference between the baroque violins and the ones used for 19th to contemporary times are so different that Marc Destrubé told me that if he went to a Microcosmos String Quartet concert (he heads it) to play Britten and found himself with the baroque violin he would have to return home for the modern one. I wondered about the metal endpin (I call it a spike) of Tanya Tomkins's cello. Usually to this amateur enthusiast this is how I discern the difference between the modern cello with endpin and the baroque without. I asked violist Stephen Creswell who explained that my idea that baroque cellos do not have endpins is not entirely correct. The endpin was known by the beginning of the 19th century. 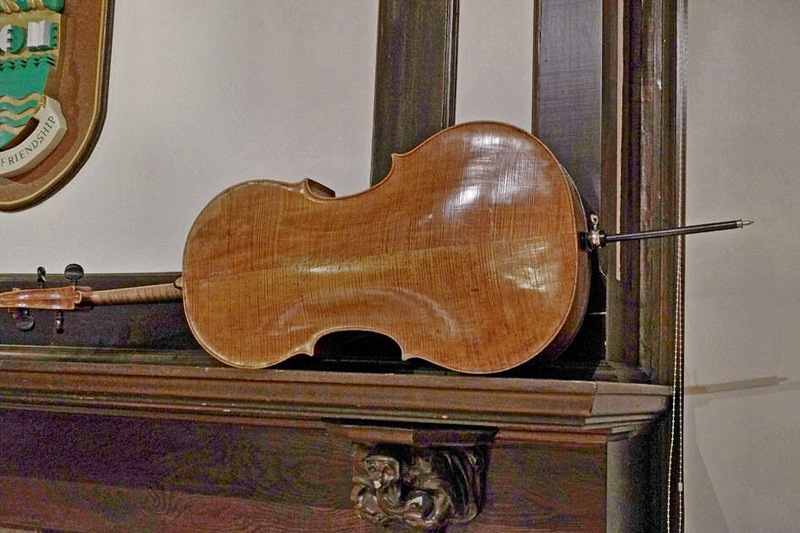 Tomkins's cello is indeed a baroque cello (Lockey Hill, London 1798) but she has the endpin (which Creswell said was usually ivory or wood) because of the added strain of not playing with an endpin if you have either a bad back or neck pains. It would seem that Tomkins's busy schedule has forced her to go with that endpin. As for harmonics, I perused the score frequently over the last week and never saw any indications from Haydn. I think Marc was performing in the moment, ad libitum. Haydn’s Symphony No 22 in E-Flat major and his Opus 51 Seven Last words don't seem related by melody or any fragment of motive to me--but what is interesting is the timbre of the English horns and natural horns as scored in the minuet, with strings below in quarter notes, is something we seem to have replicated in Sonata II, with Marc's violin sounding a little like those English horns, as Tanya's cello anchored the sound with possibly some horn overtones, and the bow-stroke we were using, very dry and articulate, contributing as well. 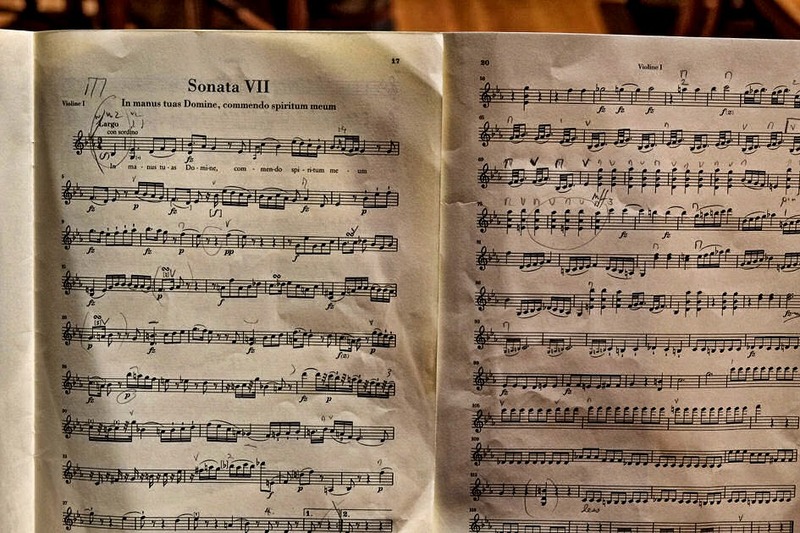 The first movement of "Philosopher" is scored with muted violins, and Sonata VII is likewise. Sonata VII also features the violins playing like two natural horns. So that may increase a listener's affinity to link the two works. At this time of the year there is a lot of coughing at concerts. I have a chronic one because of my arthritis medicine. For the last three years I have depended on Fisherman's Friends (lemon flavour). Because Lemon-Flavoured Fisherman's Friends (light yellow packaging) does not contain sugar or is as strong as the classic one you can have one of these (I choose to halve them) in your mouth without heartburn. They are most effective at concerts and the theatre. 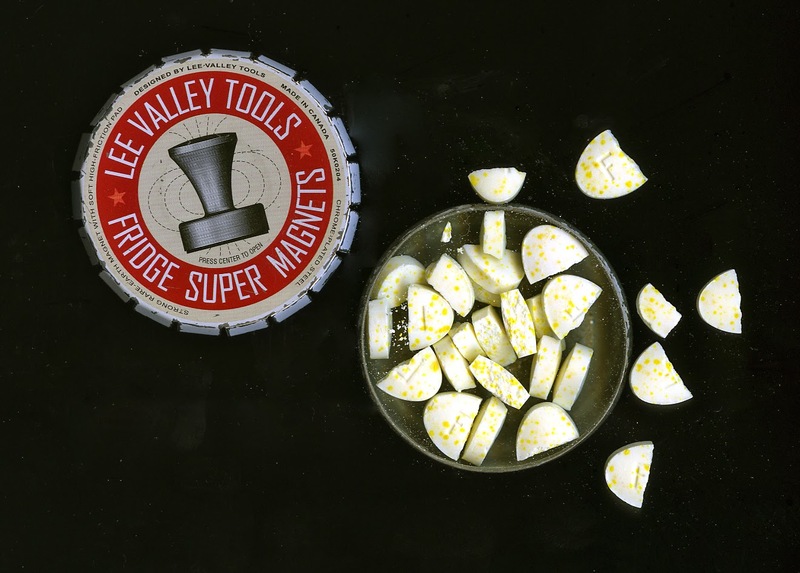 Without a tin (a Lee Valley Fridge Super Magnet container) of these I could not have enjoyed Haydn's Seven Last Words with confidence.